Graphene takes a single form – an array of hexagons, like chicken wire – but perfect borophene is a grid of triangles. However, borophene is a polymorph, a material that can have more than one crystal structure. 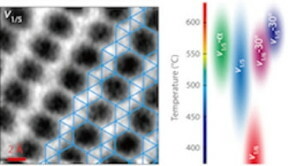 Vacancies that leave patterns of "hollow hexagons" in a borophene lattice determine its physical and electrical properties. “Modern microscopy is very sophisticated, but the result is, unfortunately, that the image you get is generally difficult to interpret," Yakobson said. "That is, it's hard to say an image corresponds to a particular atomic lattice. It's far from obvious, but that's where theory and simulations come in."